There are homeless people in Mammoth Lakes. No surprise, the same could be said for nearly every city or town in America. According to the National Alliance to End Homelessness in it its 2014 report, on January 1, 2013 there were approximately 610,042 people sleeping on the streets in America. The Inyo Mono Advocates for Community Action, one of the agencies involved in an annual homeless population count locally said they are a total of 54 individuals considered homeless combined in Inyo, Mono and Alpine counties. This number includes both the sheltered, like couch surfers, and non-sheltered but is not complete as not every homeless person wants to participate or can be found. And the local population is on the rise. Mono County Social Services says there is a definite increase of people seeking assistance in the area. A recent article in the Los Angeles Times fingers an increase in homelessness as one of many factors contributing to a double-digit rise in crime in L.A.
Mammoth Lakes Police Chief Al Davis told The Sheet the Mammoth homeless are not criminals, picked up for the occasional drunk in public or aggressive panhandling, maybe, but they’re not committing serious offenses. And, he added, being homeless is not a crime, this is America and people can choose to live that lifestyle. Asking people for money isn’t a crime, either. But, giving homeless people money to make oneself feel better, or out of simple generosity, is not actually helpful, Davis explained. He said in Ventura the saying was, “A hand up, not a hand out” that encouraged people who wanted to give to do so to organizations like the Salvation Army that actually help. Someone who is really hungry will seek out food, maybe a soup kitchen or church, not sit around with a sign on a street corner. He said giving the homeless money will just go toward booze or drugs. Davis said Mammoth does not have a problem with homeless people. To put this in perspective, Davis, in his first year in Mammoth, spent most of his career in Ventura where he dealt with “vagrants” and the homeless his entire 20-year career. He said he comes from a place where homelessness and vagrancy are a real problem, and the 8 to 10 full-timers in Mammoth are not causing a major problem. The MLPD does get called out to campgrounds to remove a patron who has stayed past the 14-day limit. Technically, a camper can stay 14 days in the Inyo National Forest not at just one campground. That limit has been given teeth this year by hosts enforcing it. In the past, campers, technically homeless, would stay a whole summer at a campground before getting chased off by the cold. Many of those who stayed long-term would drink, get drunk and loud and probably ruin other campers vacation. However, Lara Kaylor of Mammoth Lakes Tourism said MLT has not received complaints from vacationers about the homeless. Davis said it’ss not a drag on the department’s resources to deal with delinquent campers. The drag is the clean-up after the eviction as the camps become homes, places to put and store stuff like empty booze bottles, well-used furniture and general mess. Then the county or city has to assist, Davis added. Homeless still come into the campgrounds for drinking water and to use the bathrooms. One campground host who wished to remain anonymous said he’s seen homeless burn “draggers” or downed trees burned at one end and slowly pushed into the fire because they can’t afford firewood and have already gathered up all the sticks and limbs within arm’s reach. Other stories include vomit-covered bathroom stalls and piles of empty beer cans in the bushes, being loud and disrespectful to other campers. The host said there are some offenses that the police can be called about, but disrespect is, unfortunately, not one of them. There are also people who work full-time and are homeless, unable to afford the exorbitant rents on service sector wages. There are stories of people staying in a tent for the summer to save enough money to afford a roof and walls for the winter. There are services available. Mono County Social Services offers a food pantry, Cal Works homeless assistance for families and CalFresh, providing food assistance. IMACA and the Continuum of Care, a group of agencies including the Salvation Army, Wild Iris, Health and Human services from the counties, and veteran’s services offer and assist the homeless with various needs. Davis said there are many un-tapped resources available for homeless if folks have the wherewithal to seek them out. Housing Specialist for IMACA Karen Mansfield said that three new grants have recently been received; one to assist homeless veterans, one to assist individuals who need to be placed and one for those who have an apartment but have fallen on hard times and need help staying indoors. She said there are 8 homeless vets according to the latest count, again with the same margin of error. She said veterans, especially, do not want to talk about their situation. But the services can only be offered; if people don’t want the help, they can’t be forced to take it. Take John, “The Guy in the Wheelchair,” a Mammoth regular for the past year, an Army vet and for the interview, generous and hilarious. For every answer to a question, he would have at least two racy jokes about nurses or a story about drinking. 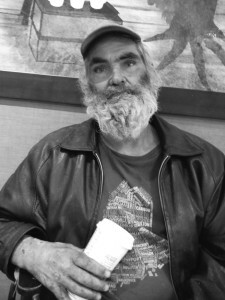 John said he’s been on the streets for eight years and would never want to go back. 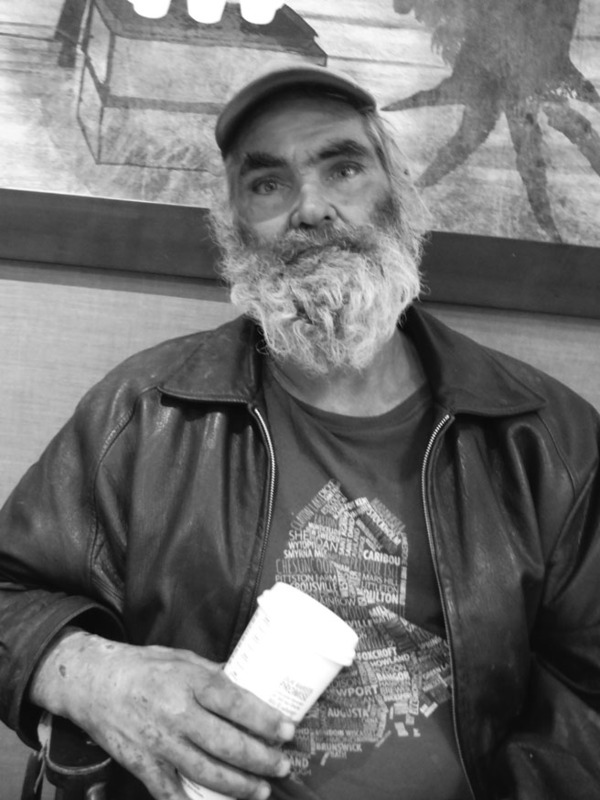 “I don’t like being homeless, but i don’t like a controlled environment either,” John said. John talked about sleeping on the streets in the big city and getting awakened by gangs beating on him, multiple overdoses and trips to the hospital, a story about going 100 miles per hour on a go-cart and the crash that landed him in the wheelchair. He offered to buy drinks for a group of little kids at Starbucks and talks about missing being married but talks about a beautiful woman he just met and he waits for her. John said he’d like to see some services offered for homeless, like 24-hour restrooms or free camping closer to town. Avicia said one service the Eastern Sierra lacks is a homeless shelter. Folks that need longer term assistance or a shelter are sent to distant places like Reno or Ridgecrest. Sometimes homeless people just want to go home and be with family for a spell. Avicia said the county helps 2 to 3 people a month with transportation. Transportation might be what keeps the homeless out of view, and maybe out of the area. Davis said the Eastern Sierra is remote enough and the weather rough enough to keep it from becoming a hot spot for those seeking to live outside. The legal camping is two miles from the town limits and keeps most of the folks camping in their spots. Being homeless is not a new concept. Dirk Jamison wrote , “Perishable: A Memoir” in 2006 about eating out of garbage cans in Mammoth in the 1970s with his family, feeding off the waste of the wealthy. Finding the homeless in Mammoth, amongst the trees and bushes can be like looking for Bigfoot. Some people claim to see them everywhere, leaving stinky footprints and empty beer bottles behind. The homeless lay passed out on picnic benches covered in vomit and scare families on vacation. I hear rumors of a Tent City, a refugee camp in the woods behind Shady Rest Campground, two miles outside the municipal limits where semi-legal camping is available at no cost. I drive past the camping restriction limit and expect to see a tent city, but there’s just a couple campers, a lone ice chest or two far from any camp. I come to a spot where my Honda shouldn’t go any further and hoof it up a well-used road to find a large tent, no one around. Two Forest Service guys in a truck patrolling the area tell me there’s no homeless out here, it’s too far from town. They tell me to look at some place by the mountain and ask me if the tent is mine. I venture up another road past a couple more campers, some with several cars, a laundry line and barbecue set-up. I climb some road that turns into a river bottom and have to back up down some twisty road on the side of a cliff then have to stop and take a call about another story. Later I see a family in town, smiling, laughing carrying sleeping bags (or are they laundry bags). They might need a shower or maybe just a shave and comb through the hair. I want to ask them about their situation, but I’m not sure. I don’t want to embarrass three little kids with embarrassing questions about what could be an embarrassing situation. What would a little kid think if he thought others thought he was homeless? Would he care?